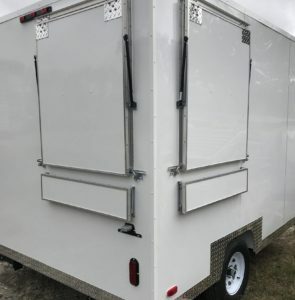 6′ x 8′ Trailer, back window. 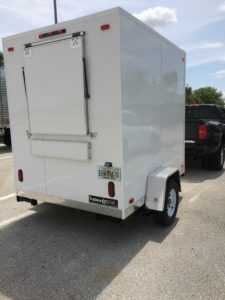 FOOD CONCESSION TRAILER, 6′ X 8′ WITH REAR WINDOW. White Aluminum exterior with diamond plate, 4″ at bottom. One (1) service window with hydraulic lift awning and outside tilt shelf. Commercial Grade Flooring (Black & White checkerboard). Custom cabinet with 3 unit sink and hand wash sink with overhead storage cabinet. Custom Stainless Steel counter tops for 3 unit sink and separate hand wash sink, with splash guard & air dry shelf. Fluorescent inside lights, interior 2. 60 AMP electrical panel with breakers. Fully wired with electrical receptacles throughout. 110 Volt water pump and 2.5 hot water heater. 15 gallon Fresh Water Holding Tank with outside fill spigot. Area for owner’s Refrigerator or Freezer. Platform for generator and propane tanks at front. Stainless steel serving counter under window, interior. All inside walls and ceiling are FRP Board (NSF approved.). Custom cabinet with 3 unit sink and separate hand wash sink and overhead storage cabinet. Custom Stainless Steel counter top for 3 unit sink and hand wash sink with splash guard and air dry shelf. 220 Volt electrical panel with breakers. Fully wired with electrical receptacles, 110 volt, throughout. Area for owner furnished Refrigerator or Freezer. Platform for owner furnished generator and propane tanks. Stainless steel service counter tops under interior windows. Roof top air conditiioner, 13,500 BTU, RV type. Stainless Steel Hood with exhaust vent and Fire Protection system. Equipment: Fryer, Chargrill, Refrigerator, Freezer, Sandwich/Salad Prep. Additional stainless steel tables, shelving, racks as needed.